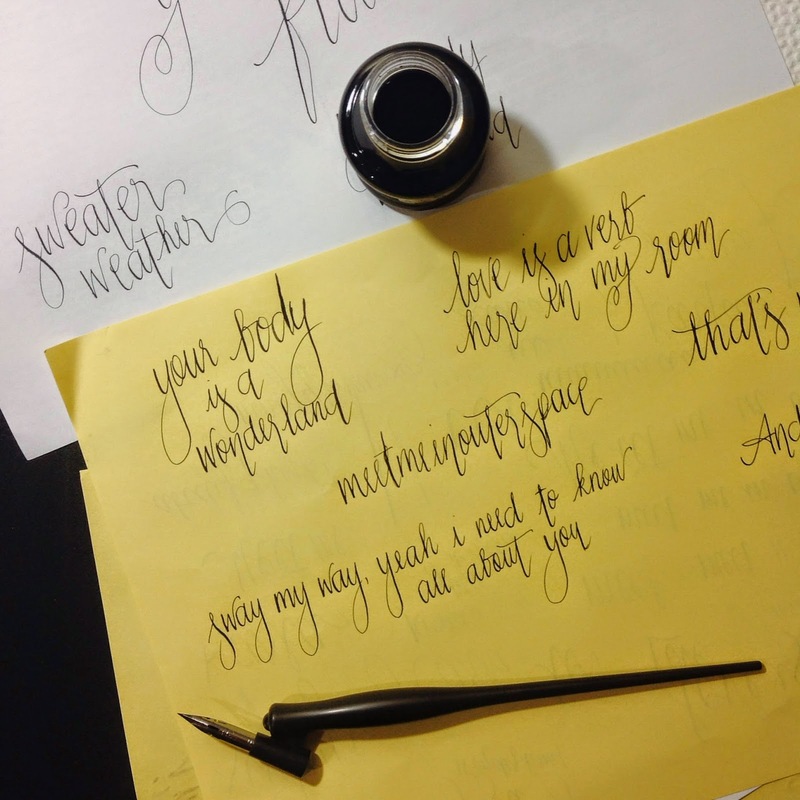 Which is why I kept asking myself the last few weeks, "Why haven't I tried calligraphy?" I have no idea why I never considered it before. It makes sense to have it as a hobby, given the amount of doodling I do. Maybe it's just that I never really saw people I knew doing it. It wasn't so accessible an idea to me. Until now. A few weeks ago, I bought myself two calligraphy markers from National Bookstore and spent an entire night - guiltlessly - just writing down the choruses to Taylor Swift's new singles. And just over the weekend, my good friend Jio bought for me actual calligraphy supplies: two nibs, two pen holders (one straight and one oblique), and a small jar of ink. And now, here I am, trying (and failing!) to make elegant scribbles in longhand. I guess I'm pretty lucky my cursive is quite decent, thanks to the Paulinian handwriting the nuns forced us to learn in grade school. It's actually overwhelming! Holding the pen takes a lot getting used to. So far, I'm still committing a lot of rookie mistakes. (Please forgive some messy letters in the picture above!) But it's great fun. It's relaxing, in the same way my regular, ordinary doodling makes me feel, but it's also challenging, which is always a good feeling to have. It's a nice distraction from the rigidity of law school. A really, really fancy distraction.